For debugging it’s often useful to see all queries and since you usually don’t want to save all this data, it’s nice to be able to turn it on and off efficiently. You can log to file but also to a table in the mysql database. One nice thing about logging to a table is that you can search for specific things, see examples below. Then simply turn OFF when finished. After adding a new worker node to a swarm, it had errors including problems communicating with other services/containers on the overlay network (previously added nodes, both manager and worker, worked fine). It turned out that this newest node used a new installer that defaulted the storage driver to overlay2 — where the previously installed nodes were using aufs. All nodes are running on Ubuntu 16.04.
and restart Docker (via systemctl restart docker.service or similar). Note that any images or containers created with the old storage driver will not be accessible to the new one so you should delete/prune/etc what you won’t need and stop & remove all running containers prior to restarting. Rich Hickey emphasizes simplicity’s virtues over easiness’, showing that while many choose easiness they may end up with complexity, and the better way is to choose easiness along the simplicity path. 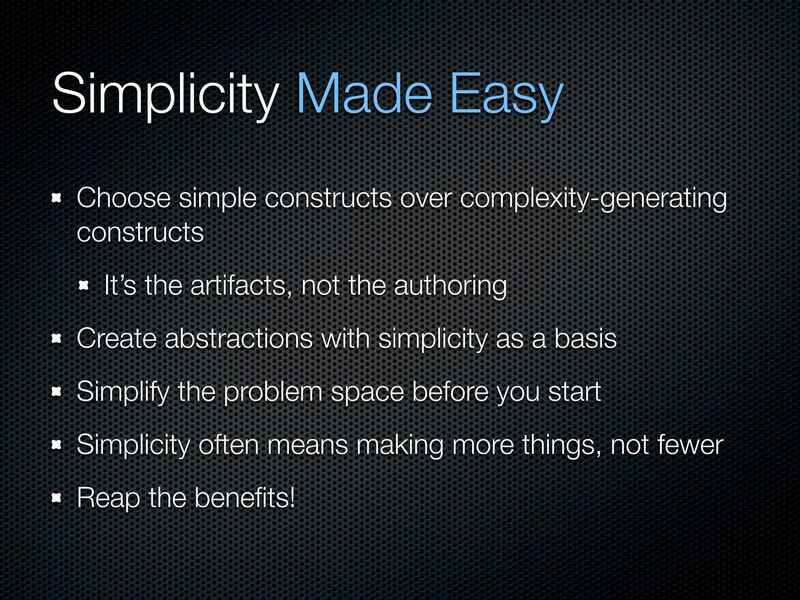 We should aim for simplicity because simplicity is a prerequisite for reliability. Simple is often erroneously mistaken for easy. “Easy” means “to be at hand”, “to be approachable”. “Simple” is the opposite of “complex” which means “being intertwined”, “being tied together”. Simple != easy. He even predicts (to some extent) microservice architecture by declaring a set of separate strings hanging down independently can show a byproduct of simplicity can be more things, but things that are easier to understand and manage than if the strings were intertwined — and easier to update individually. If you want to swap values in one query in MySql without a temporary table, you can use variables to hold values that otherwise would be changed before you can use them.